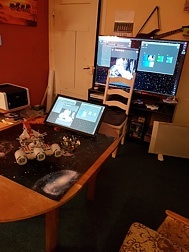 After asking my players I have started 2019 with some more technical support on our game table. 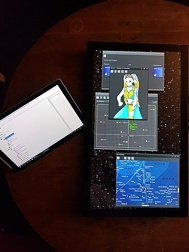 My first intention was a big touchscreen display, laying plain on the table like a tablet. 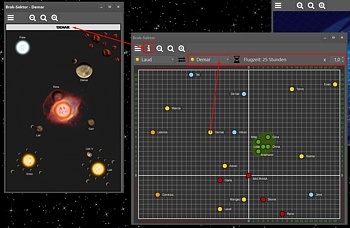 But on the game I have seen some problems with this idea if it comes to more but battlemaps. Well, I stay on the touchscreen display but I use it like a GM screen as you can see on the photos below. But what's the intention with this? One intention was to have a tool to present my handouts while on the game - without to have to print everything. Another intention was to show how long a ship has to fly through the galaxy. On the past I had to look on a sheet to give the answer. 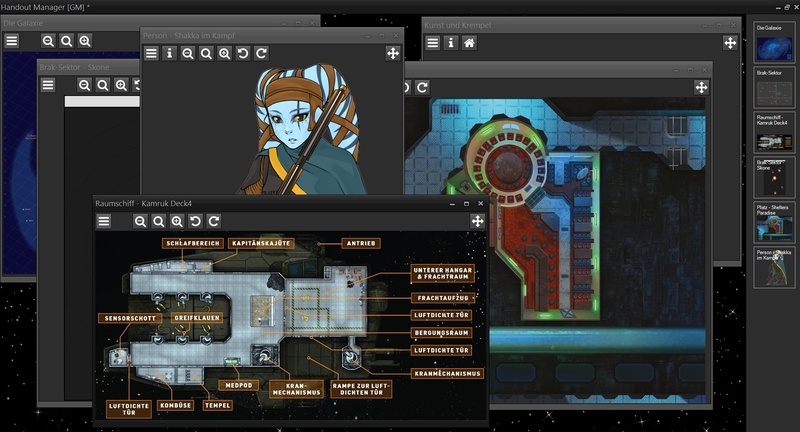 And often my players wanted to know what Droids they have on their ship, some known data about persons or the floorplans of their ships and places. Then I had to rummage my notes or my players passed their tablet around. And all this my players should make on their own too - or if I want it to show them. So I have written (and still writing it) my own handout manager software. 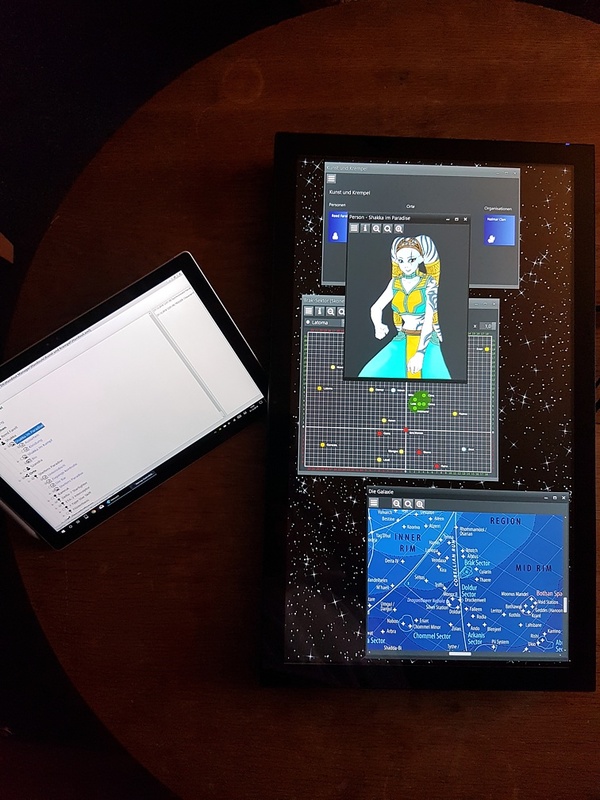 The base is a 24" FullHD touchscreen display can stand (or laying) an our gaming table. As said, this is placed like a GM screen but with "changeable pictures" on the outside (to the players). This screen is connected with PC stick (a whole Windows 10 computer with the size of a big USB stick). The stick has a Wifi connection to my home network and we are using a small bluetooth mouse as backup for the touchscreen or for players to far away. As one part the Handout Manager (I have named my program like this) has the ability to show star maps with dynamic places (like the planet systems on the Brak sector) and flytimes on different speeds. So my players can look for their flytimes on their own and I don't have to note alle possible route before. 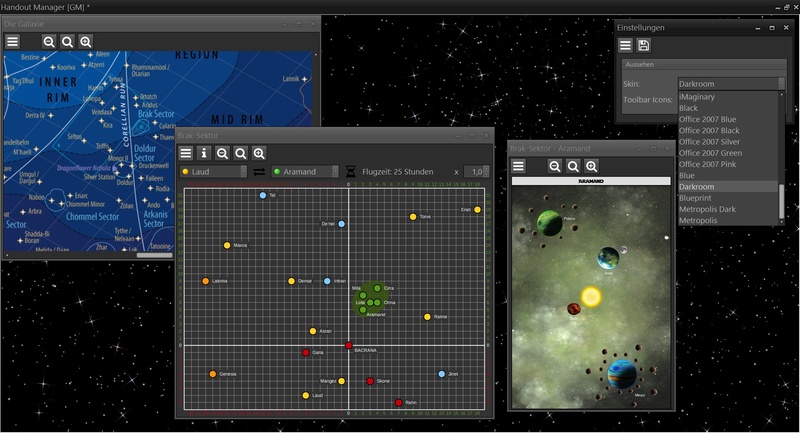 Also they can open planet systems detail maps on the fly if they want. 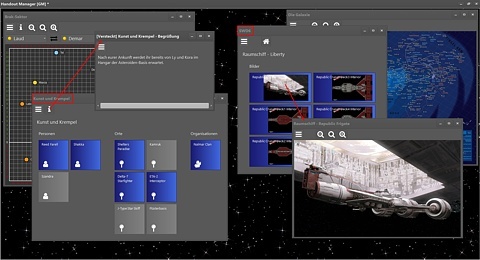 Another part is the presentation of campaigns, missions or story backgrounds, all called "Handouts" on the program. This handouts are divided into characters, places and organizations. 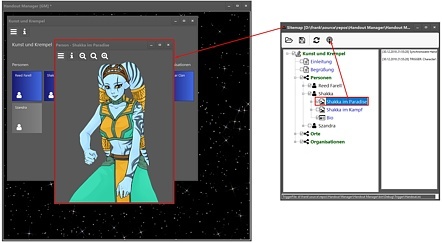 A character can have multiple notes, multiple pictures (with and without notes to every picture), char sheet data up to PDFs. The same you can have on places (subdivided into groups like planets, places, spaceships, and so on) and organizations. Of course they have no char sheets but they can have members (of an organization or owner or resident of a location). On the frontend GUI the Handout Manger is optimized for touch screens and easy handling. The GUI is widely skinable too. Windows can easly moved or maximized, pictures can be zommed with pinch-to-zoom gestures like you know from your smartphone. Players can open, close, change and focus all parts the handouts. For the GM the Handout Manger has built-in tools to deal with all the star maps and handouts data. So he can hide parts of a handout at will or add GM-only notes. And there is a special remote part on the Handout Manger. The GM can open a handout on a 2nd tablet and will only see the parts of it on a tree-like sitemap structure. He can see if a part is available for the players or not. Then he can change the hidden/visible flag of every part on the fly without to edit the whole handout data. And he can force the Handout Manager running on the touchscreen to reload the handout after he changed the data - thats because I said "remote part". Even more, the GM can force the Handout Manager to load a whole new handout, open and show a picture, note, everything. And he can close it remotly too. And newly the GM can add MP3 audio files to the handouts too and can play/stop them remotly too. 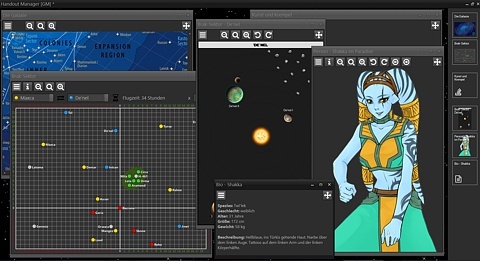 - All with an easy touch interface to work with on the gaming session. Well, we have used the Handout Manager on our last session and my players liked it. What do you think? Would this be a possibility on your gaming tables too? I know there are many groups don't like smartphones, tablet or laptops on their games at all. But on my group, they often had looked for notes on their tablets but with the Display in front of them they where more focused on this. 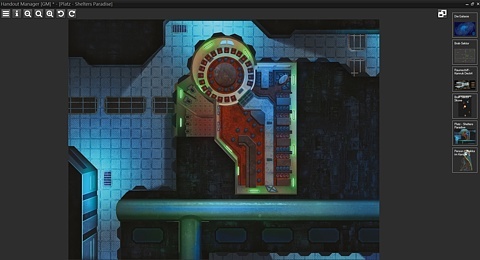 And well, a little bit tech is nice on a scifi game, right? 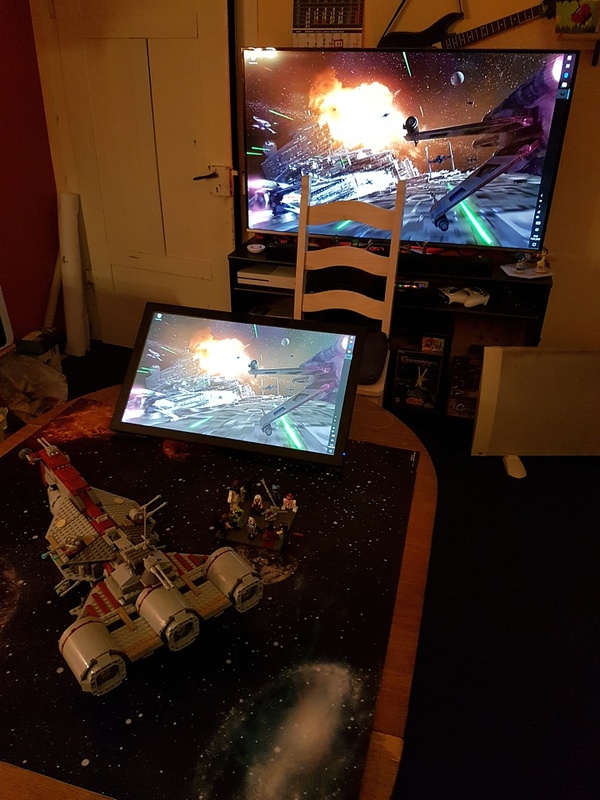 That's some dedication to creating a tabletop experience. I personally couldn't use this since I don't have a touch screen. But I think it sounds like an amazing piece of software. I know a lot more games are moving in this direction, and I would totally use this in a number of games if I had the hardware to go along with it. Well, technically it would not be necessary to use a touchscreen at all. So you could use a simple monitor or TV, as long as you can show Windows on it. Then you can use a wireless mouse and you are ready to go. But yes, it was a nice experience with the touch. Previously I had to hand over my prints and every player was looking on it, it was a some kind of interruption. Now I tell the story and press the button on my tablet at the same time. The person I have talked about is shown in front of me and my players are looking to the picture I wanted to show them and to me at once. 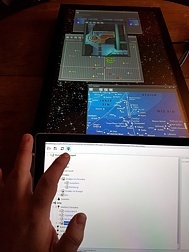 Also if they looked for flyroute and planet systems, it was more like using an in-game nav computer than reading tables on a source book. It was not perfect - not yet - but a nice immersion expericence. And I had tried and searched a lot of programs, but they couldn't satisfy all my requirements. My first - and also most important for me - requirement was I can run the program on my own, on my hardware, without an online connection. 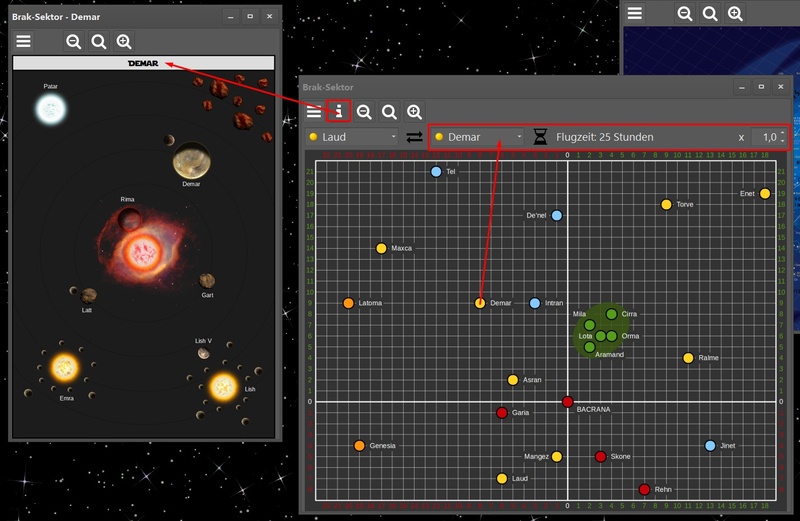 So there are some nice virtual tabletop programs to show battlemaps or even deal with handouts but they are designed to use on online sessions sitting in front of your PC. To complicated and to clumsy to use around a table. There are some programs specialized to deal with handouts too, but most of them are made for GMs outside the gaming session. And if I had find someting like "Yeah, that's it!"... well, it was an online-only website thing. So my only solution was to write my own program where I can optimize it the way my players and I want to go. Wow. Yeah, I'd definitely use this. No question. In fact, I'm somewhat envious that my own campaign isn't using this.